The Anniversary of Swami Vivekananda's famous lecture at the World Parliament of Religions at Chicago, is celebrated by Vivekananda Kendra as Universal Brotherhood Day every year. This year is of special significance as it is the 125th year of Swamiji’s Chicago speech. In this connection, a number of competitions were planned for the school children. Since most of the schools had been badly affected by the sudden floods, only the students of three schools viz. SN Vidyalayam- Chentrappinni, Amrita Vidyalayam and Shantiniketan International School- Kodungallur, registered their names. 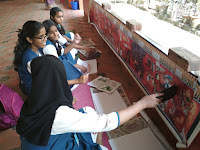 On 6th September , there was painting competition for Junior( class Vto VII) and Senior groups( classes VIII to X ). 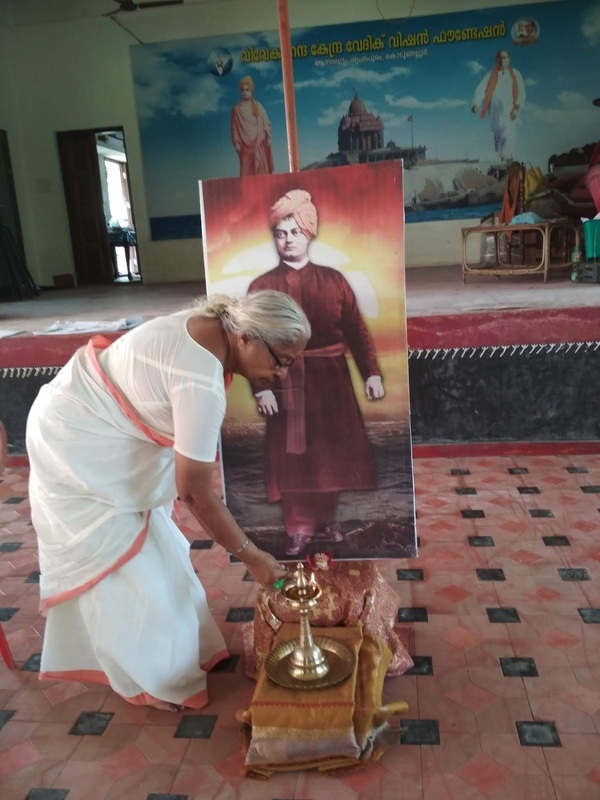 20 students participated.After lighting of the lamp, Mananeeya Lakshmi Didi spoke to students, encouraging them to perform with full vigour and concentration. 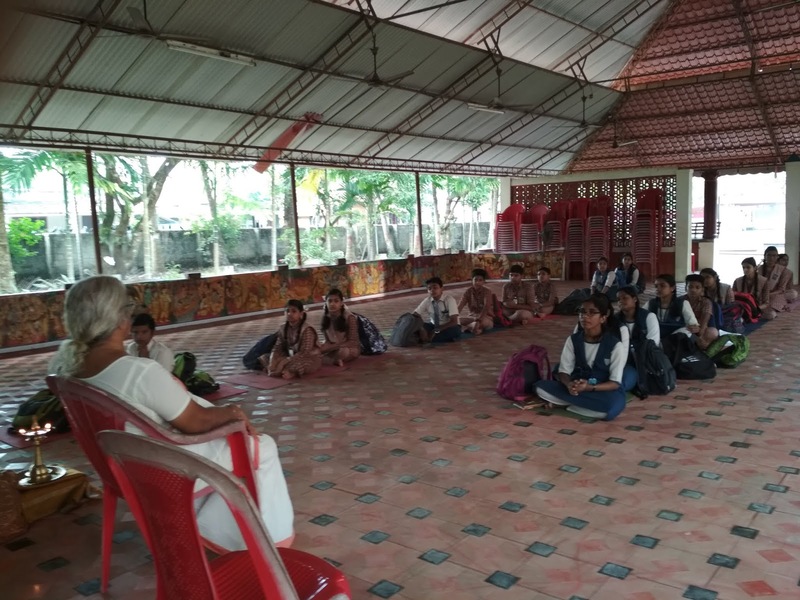 Topic for the junior classes was'Scenes from Ramayana' and for the senior classes it was' Incidents from the life of Swamiji'. On 7th September, Elocution Competitions (English and Malayalam) ie. getting by heart and delivering speech of Swamiji ( selected from the first and last speeches delivered by Swamiji in Chicago Parliament of Religions) were conducted. 33 students participated. While speaking to the competitors, Didi asked them to believe that while delivering the speech they should feel as if it was an offering at the feet of Swamiji because it was because of this great patriot saint that we are able to lead a dignified life today. It was because of Him that the world recognised the greatness of our culture. On 11th September, the public function was held.Along with the prize distribution for the winners of schools, distribution of pressure cookers as the third phase of relief work for 400 flood affected people, was also held. 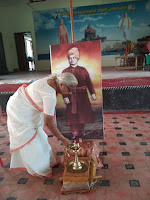 Sri Piyush a young Vedantist from Thrissur as the Chief Guest along with Retired Major General Vivekanandan - a close well wisher of Vivekananda Kendra.and Ma.Didi were present on dias. This time the winners of rolling trophy for Malayalam Elocution was Amrita Vidyalayam and that of English Elocution was SN Vidyalaya. 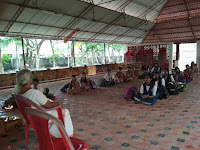 After the Shanti mantra, all were given prasada. Overall 400 people attended the Universal brotherhood programme. After the prasad, the beneficiaries were given pressure cookers.